Simply take a look at the cover of this book, and your curiosity will be piqued. 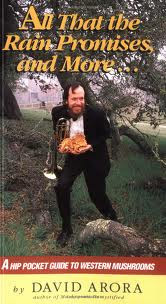 A tuxedo-clad trumpet player with a devilish smile on his face, clutching a handful of chanterelle mushrooms foraged on his way to perform at a wedding. This photo exemplifies the strangeness one might find inside the book. Despite it’s original publishing in 1974, this pocket guide to western mushrooms is surely relevant to the amateur forager of the west today. All mushrooms have been photo identified, and discussed briefly on when and where each may be found, are complete with edibility recommendations, and other interesting, strange, or downright bizarre uses for said mushroom. A handy reference guide at the front and back of the book help for quick identification, based on physical characteristics, and 2 indexes reveal both Latin and common names. Sufficient warnings are listed for potentially and known dangerous mushrooms, and one can take comfort in knowing the author is well versed in all things mycelium. David Arora is also the sole author of the reference text, “Mushrooms Demystified,” a staggering 370 page authority on said topic. This book is utterly charming in its tales, ranging from the happily Polypore-dyed dog sporting a newly colored coat on page 189, to the correlation explained between the size of one’s smile and the size of his Matsutake find on page 87. The book hosts an array of giddy foragers throughout and gives way to an exciting prospect of tireless fun for curious (and eccentric) people.